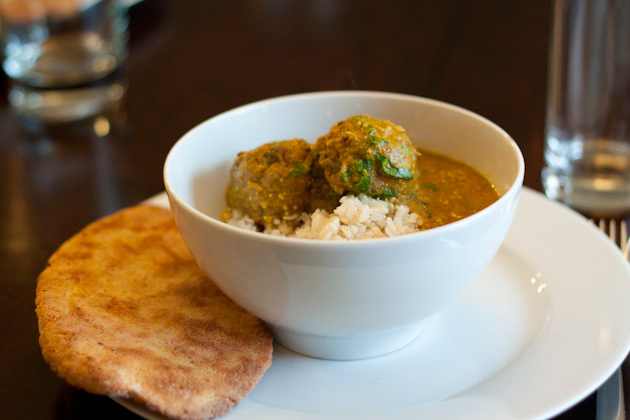 For more on the flavors of India series, check out: Dhal Aloo Kofta, Aloo Palak, Gluten-free naan and Payasam Pudding. When we have friends over for dinner I like to choose recipes that are made up of simple ingredients, will appeal to the masses, won’t dirty a bunch of dishes and; most importantly, can be made in stages to lower the potential of me becoming a total stress case 1 hour before everyone arrives. While planning for a recent dinner party with our neighbors, I racked my brain over what meal would meet all of these requirements when I remembered an India favorite… malai kofta. The meal I chose was made up of 4 parts: vegan ‘meat’balls (aka kofta), sauce (aka malai), rice, and gluten-free naan. The malai kofta I made in India was made up of vegetables, milk, cheese, wonder bread, and the kofta were deep fried in oil. As we were making them I was creating a list of all the adjustments I planned to the recipe in order to make it healthier, vegan, and gluten-free. In my rendition of this popular Indian meal, I replaced the milk with water, the bread with extra potato, then added a bit more veggies for good measure. 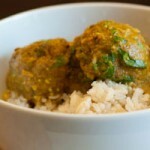 The result was phenomenal; dairy-free malai kofta, and I hope you’ll think so too! Malai kofta is a dish usually reserved for special occasions. 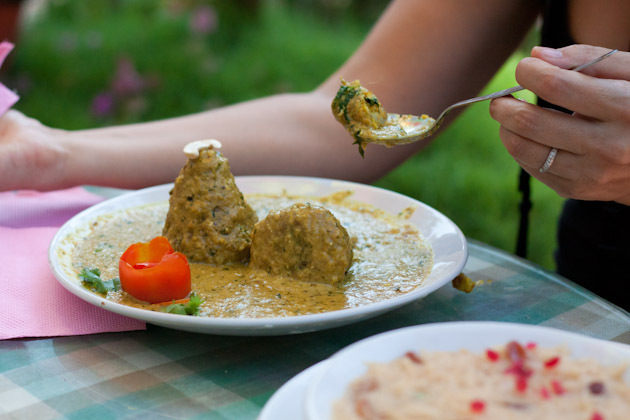 It’s made up of malai; a rich creamy sauce, and kofta; which means meatball. 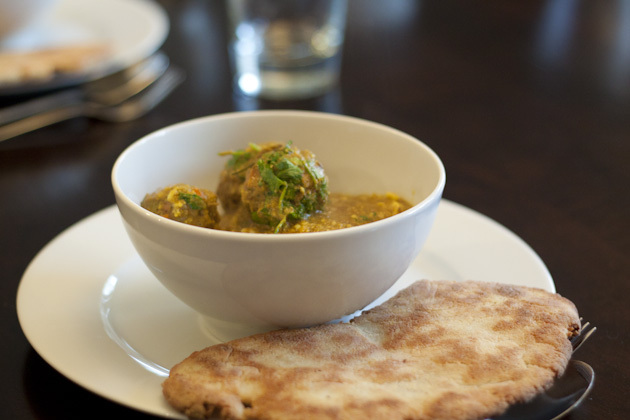 The majority of malai kofta served in India is vegetarian and is usually served with naan or rice. Prepare kofta as per directions in this recipe. In a preheated frying pan, add oil, onion, salt, fennel seeds and turmeric. Sauté for 2 minutes on medium-high, stirring constantly. Add to a blender with tomatoes and water and process until smooth. Set aside. Preheat the same frying pan on medium-high. Add ghee, oil, cumin seeds, ginger, and garlic. Sauté for 1-2 minutes. Add coriander, cumin, masalas, water, paste, cilantro, reserved sauce and kofta. The longer you allow this to cook, the spicier it will become so just cook until the balls are heated. 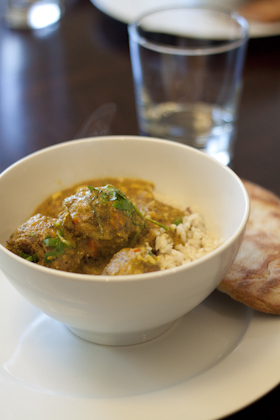 Serve with rice flour naan (recipe below) and rice. 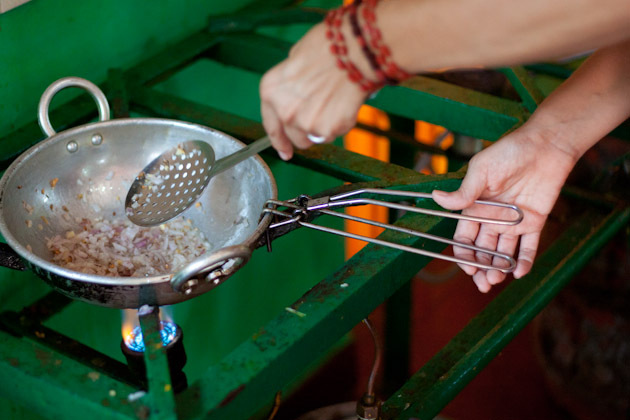 To make vegan and dairy free, use coconut oil instead of ghee. Ghee is made from dairy, but all lactose and casein is removed in the clarification process. Use your own personal judgment when opting for a dairy-free diet. If you’ve chosen to omit, use vegan suggestion above. I’ve been trying my hand at gluten-free naan every second day since I got home and this was the first one I was happy about. It’s not perfect and still needs to be worked on, but it’s darn good. The flavor is there, the shape is there, but the texture needs some attention. If anything, it reminds me a bit of bajra roti but then again, perhaps I’m being too critical. Oil a large cast iron pan with coconut oil and set aside. Combine warm milk, sugar, and yeast. Place in a warm place for 5 minutes. To prepare wet ingredients, blend water with vinegar and sunflower seeds. Pour into a small bowl and add oil and egg. Place dry ingredients in one bowl and whisk to combine. Combine wet to dry and add in yeast. Stir to mix, then roll into 6 balls. The dough will be sticky, just keep working with it, adding white rice flour to make it more pliable. Place dough balls on a plate and cover with plastic wrap. Place cast iron in preheated oven for 5 minutes. Remove, place 1 ball of dough on the side of the pan and press firmly into pan with floured fingers. Flatten out into a teardrop shape, about ¼-inch thick. I was able to fit 2 balls on the pan at once. Return back to oven and cook for 3 minutes/side. One complete, wrap finished naan in a clean kitchen cloth. If you want it a bit softer, steam it for 10 seconds, or microwave in a glass container with the lid on for about 45 seconds per piece. Repeat with remaining dough, oiling the pan as necessary between each batch. 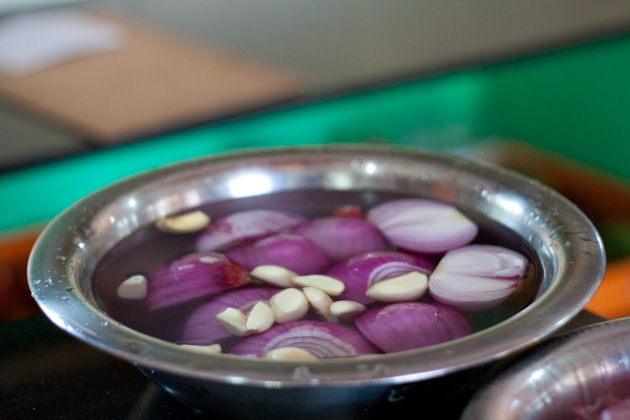 To avoid your eyes from watering when cutting up onions, halve them, remove the skin, and place in a bowl of water for a couple of minutes before dicing. I guess it’s all the rage in India. The instructor couldn’t believe I’d never heard of it. Previous to learning this new technique, I’d just stick out my tongue while I chopped onions. Get your mouth real wide, just let your tongue hang out of your jaw! When I told the instructor this he thought I was joking. It does look rather ridiculous, but I swear it works! 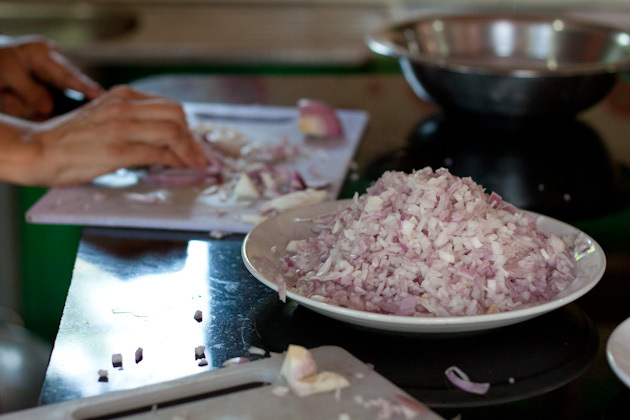 Do you have any tricks on avoiding crying when cutting onions?